Shaun of the Dead Bloody Shaun Pop! Vinyl Figure - EE Excl. 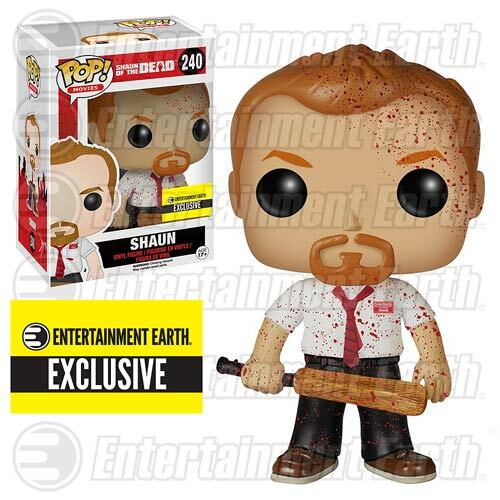 Exclusive bloody version of Shaun! Entertainment Earth Exclusive! In a time of crisis a hero must rise... from his sofa. Stop the zombie uprising and have some flesh-eating fun with the Shaun of the Dead Bloody Shaun Pop! Vinyl Figure! This limited edition version of Shaun features a special blood-splatter deco and applies Funko's unique stylized vinyl look to actor Simon Pegg. Armed with his cricket bat, the Shaun of the Dead Bloody Shaun Pop! Vinyl Figure measures approximately 3 3/4-inches tall and comes packaged in a window display box.